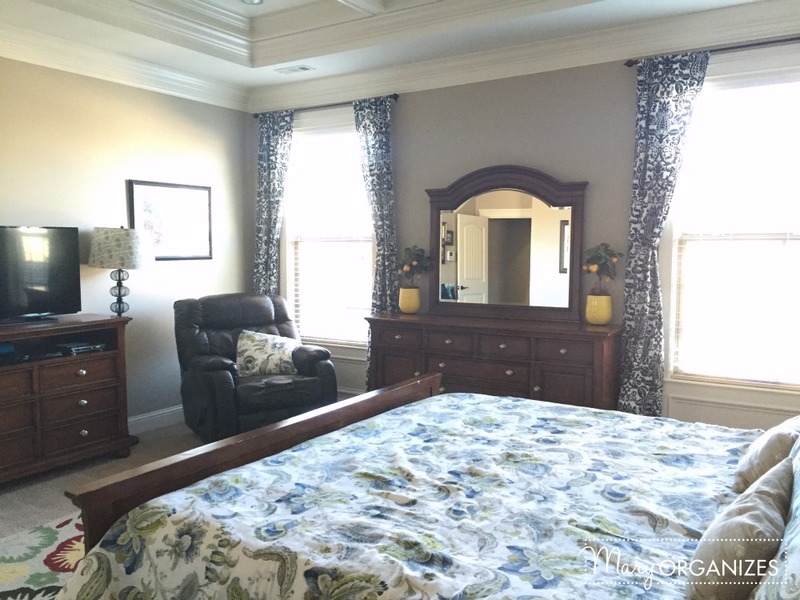 My Master Bedroom – the place that isn’t about kids or work or responsibilities. It is the place I rest from all of those things. There is an epidemic I see, where people treat their bedrooms like dumping grounds. I think it starts that way because we can close the door when company comes. This makes me so sad, because in my opinion – who cares what people think who come to your house every once in a while? How do YOU feel in your house every day? 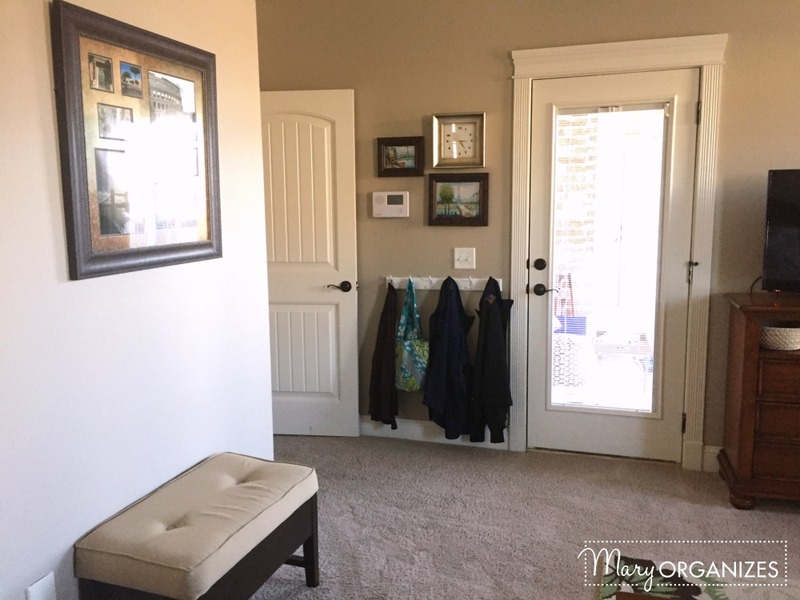 Make these changes for yourself and for your family, and then ironically, your house will look better more often for those people who drop by once in a while. I hope you enjoyed a little peek into my sanctuary. 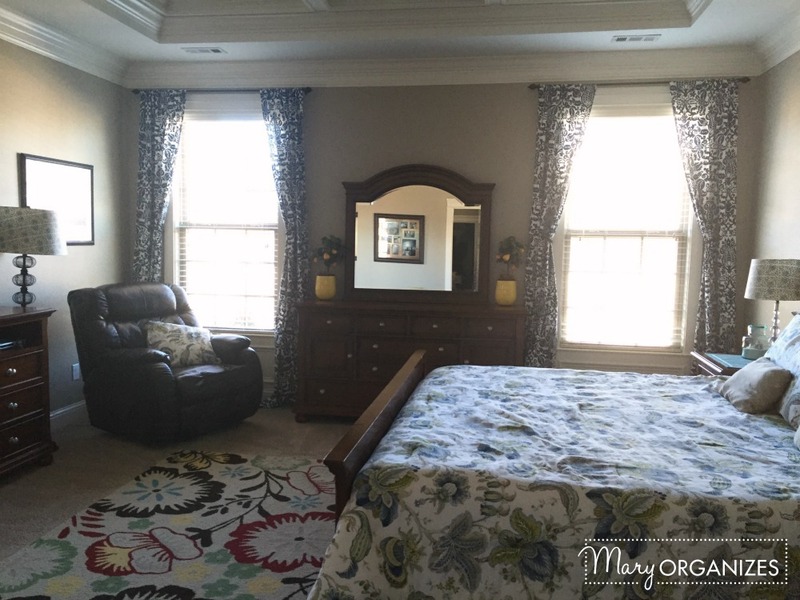 Last year I also gave you a tour of my Master Bedroom, and though I’ve tweaked the decor a little bit and added pull-backs for the curtains, it is mostly the same. Is it me or are the lampshades on the bedside lamps two different colours? Love all the different florals, bold and not “girly”. I think they are! Pink and blue – maybe his and hers? I like it. Yes, blue and red (though the red is kind of pink-ish). I was trying to go for the matching- but not identical matching type effect. Thanks, I will have to take a look. I just discovered your blog, so everything is new to me. No broken record here 🙂 Enjoy! Very very nice! I would love that bedroom!! Thanks Meg, I love it! As always, your home is beautiful! I especially love your bedroom ceiling! Don’t you have a stack of books to read or some family photos? It looks like a very pretty model home, not lived in. 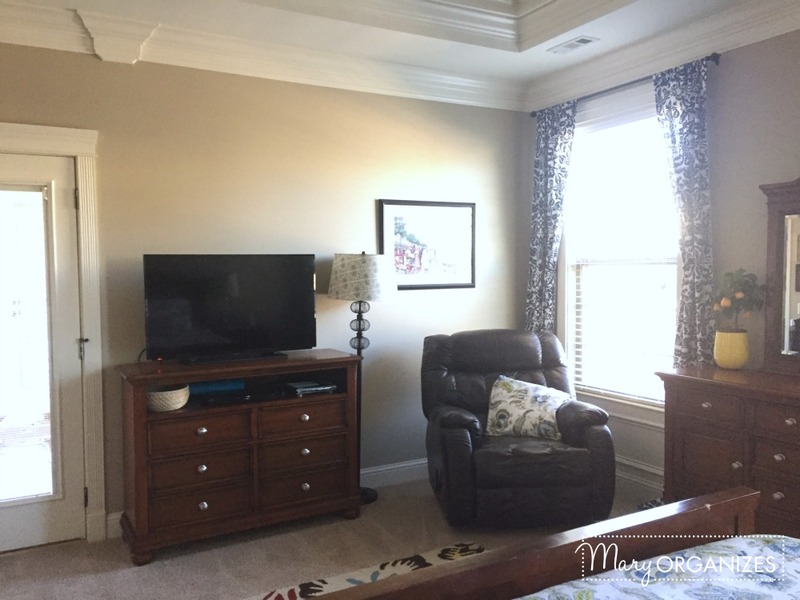 There are lots of personal touches all over the room that would make it very different from a model home. The wall above the bench has a frame with pictures from our 10th anniversary trip. In the corner of the room is the collection of spoons I started in my childhood. The pictures of France surrounding the clock are from my travels to France. The picture above the chair is a poster I pulled out of the dumpster during my college years because I just loved it and I still love it (and have since had it framed). The glass jar on my husbands nightstand contains sand and shells from our favorite family trip to Florida. The crystal bowl on my nightstand was a gift from my father when he got home from a business trip overseas when I was a teenager. The room is full of personal things, but personal does not have to mean cluttered … which is what I think you mean when you want it to look lived in. The drawers in the nightstand aren’t full of clutter, so I can fill them with personal items (like books and lotion — that is literally what I keep in my top nightstand drawer, you can see the inside of the drawer in last year’s tour that is linked to at the bottom of this post) that I don’t necessarily want to decorate with. I did leave out that yellow book under the crystal bowl because I love the color yellow of the cover. You are used to “lived in” meaning a little “cluttered/messy”. This room is very lived in and stays clean like this and this is what is comfortable to me. 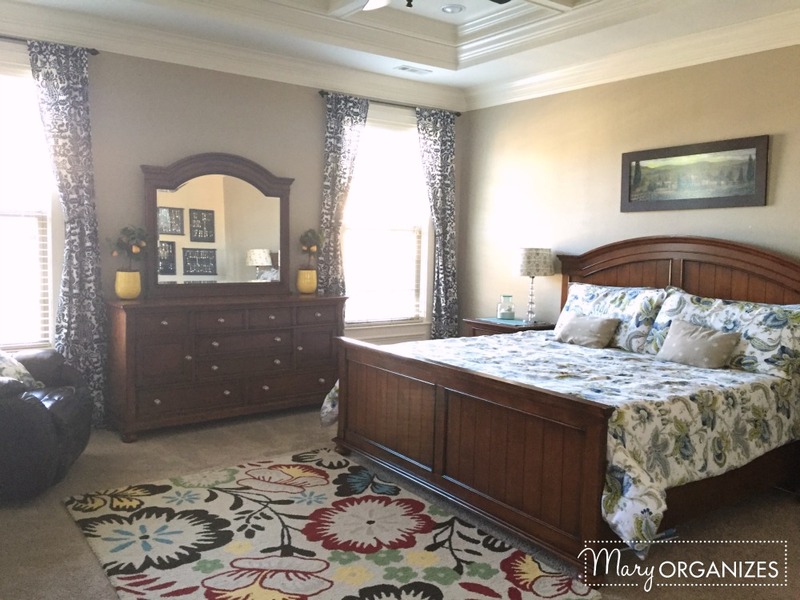 Can you imagine how relaxing it is to come into a clean, decluttered room every night to go to bed? This is my sanctuary from the world, and though I do display some meaningful things to me … it is not where I want to store dust-collecting knick-knacks (especially since I’m allergic to dust). I don’t think you intended to offend me with your comment, especially since you did tell me that you thought it was a very pretty. 🙂 You could probably tell that you hit a sensitive spot, though. Really, I just want to teach people through my blog what a new version of normal could be and that is what I’m trying to help everyone achieve through the challenge I have planned for the year. I see lots of personal touches. It is just a clean room. I love it!! Love the area rug! Where is it from? Thanks, Angie! The rug is from Target about 6 or so years ago, so I’m not sure if they still have it. I have loved the look, but have dealt with the extra shedding over the years. Sometimes pretty things come with a price! I love your pear trees. I just got my pears for a bowl in the living room. 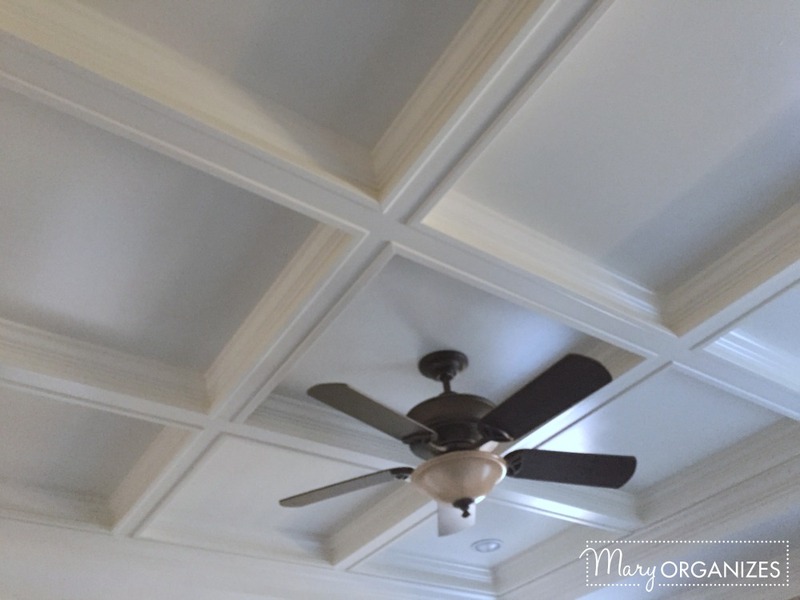 The coffered ceiling is the star of the room. Sigh, it won’t work with the architecture in my bedroom. 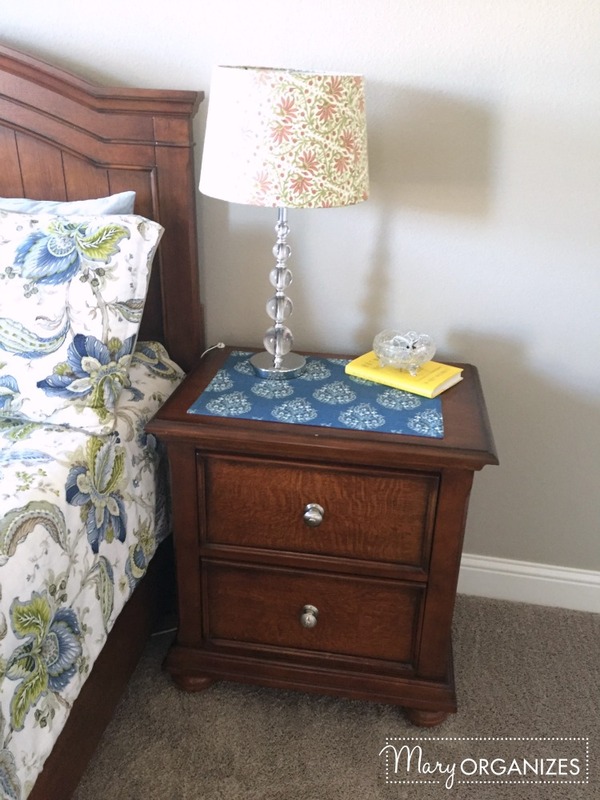 I have a dresser very similar to yours and I am thinking of changing out the hardware to white porcelain. 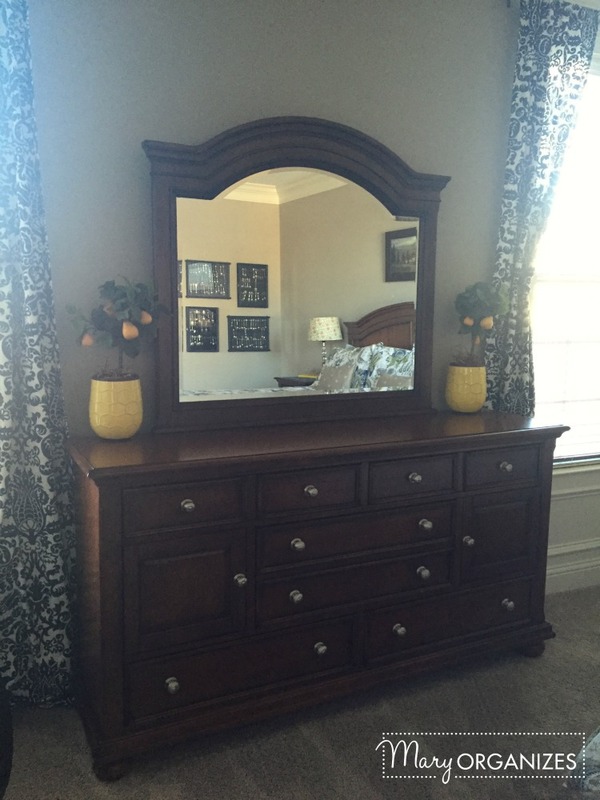 There are 17 knobs and 4 pulls so this is not a cheap upgrade, I have already changed out the heavy mirror with two oval mirrors (I painted the frames to match the bureau) My Scheme for the whole house is blue, white and yellow but I stopped dead when I saw a beautiful coral bedspread with all sorts of accents in various shades. You are such an inspiration, Mary. Please keep it up. The top of my bureau is visible for the first time in years. Oh, blue and yellow and white sounds sooo lovely. You are only missing green to hit all of my very favorite colors. I started to add in coral last year and have not regretted it, though it has not made it’s way everywhere in the house yet. I truly believe in using the colors that make your heart sing when you see them! I love the sound of what you’ve done. The progress sounds great as well! Just keep going! I love your bedroom. However, my bedroom is a lot smaller and can barely contain a queen size bed, armoire and dresser. It always looks cluttered. Do you have a closet? Maybe select either the armoire or the dresser to keep. 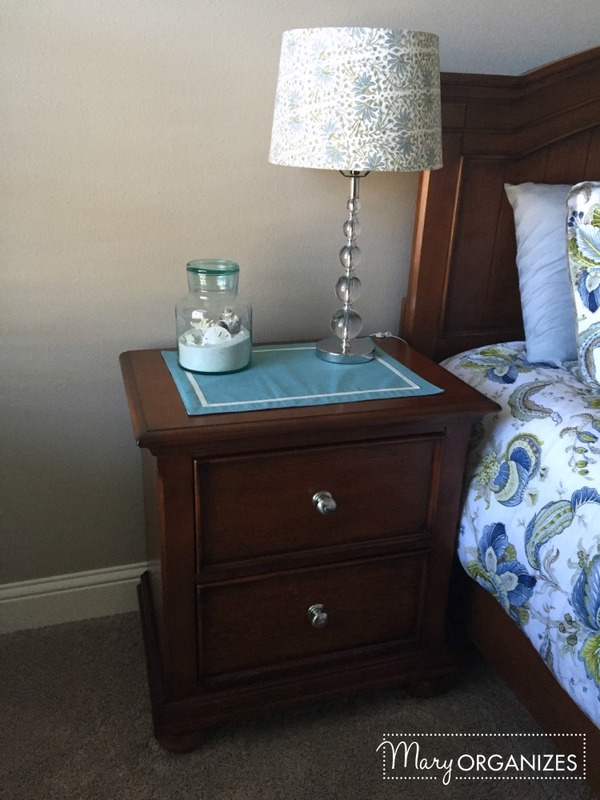 Finding a new place for the items inside may be worth the room feeling so much better! Sounds like you have a big motivation to declutter because everything you can remove from your home will make your home feel that much larger! I love this room! It seems so relaxing and inviting.